I saw this display in Oulu on 17 September 2001. Because the photos have not been around in the internet, I dare to make posting even though the event is not so recent. The display has all the odd radius column arcs except the 23° arc. Images are stacked from 3-8 individual images. The one on the lower right is also flipped horizontally to get a bit more definition. For the upper left and lower images, simulations of the pyramid column arcs give crystals as in the figure. Also shown is similarly shaped real crystal, photographed during a weak odd radius column arc display at South Pole in 1999. From pyramid plate crystals there is the 23° plate arc in all photos, and lower 9° and 24° plate arcs in the upper right photo. The display was discussed in more detail in September 2003 number of journal Weather. 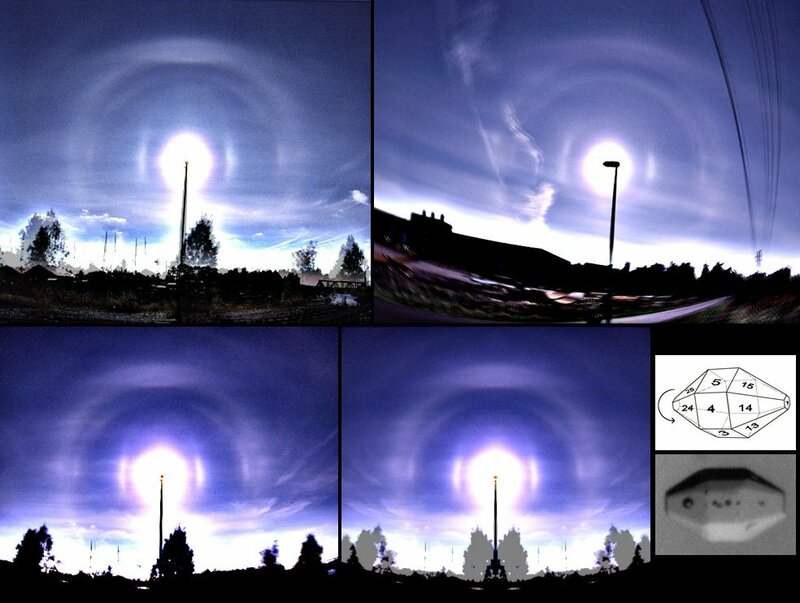 It also appears in the book "Atmospheric halos and the search for angle x" by Tape and Moilanen. Marko that looks like a simulation I did with halosim be cool of there were odd radius parry arcs but there was no odd radius parry arcs. Yeah, no pyramid parrys. These pyramid columns had 5° tilts. Had they been in Parry orientation, maybe we would have rather had pyramid Lowitz arcs. Yeah I did some sims or pyramidal lowitz arcs and the halos were quite unusual.